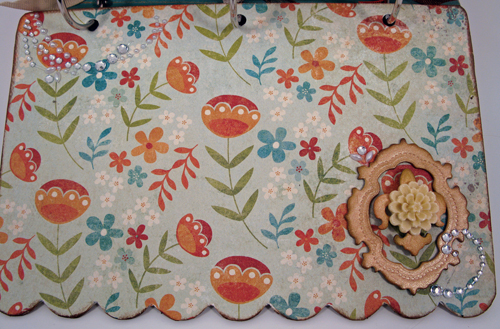 Here's the finished mini album featuring Cut Cardstock's Savoy heavyweight cardstock. As I left you in my last post my intent was to "embellish with relish! ", and that's exactly what I did. There are loads of different and fun techniques used throughout this mini album and I'm going to share several of them with you. Feel free to drop me a note if you have any specific questions. 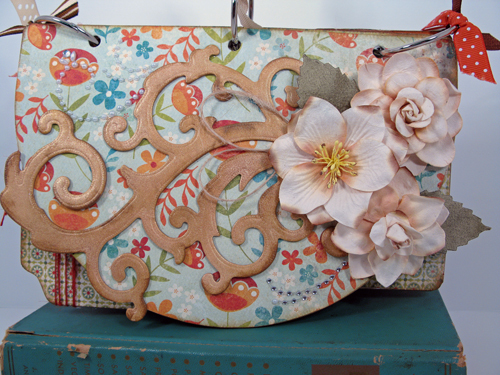 On the cover I used Tattered Angel's Glimmer Mist in bronze to color this beautiful flourish from their Glimmer Chips line. After the flourish dried I edged it with Distress Ink (tea dye) to give it an aged look. While the chips are self-adhesive, I found that I needed to add a bit more liquid adhesive (Glossy Accents) to ensure it stayed put and didn't lift. Next I added some paper flowers and bling from Prima Marketing, as well as a couple suede-like leaves. 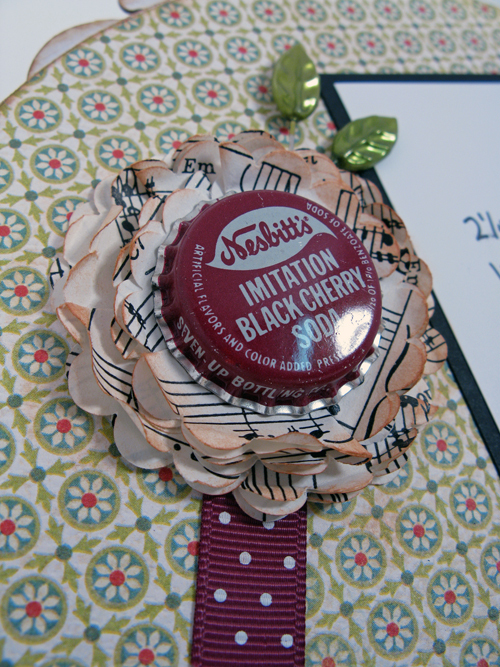 On the first page I created an easy-to-make paper flower using sheet music and a 2" Gluber (kind of like a giant glue dot), as well as an old bottle cap, a couple vintage leaf pins and a swatch of ribbon. 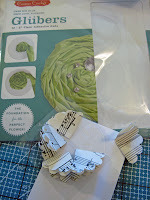 Simply use a scallop circle punch to punch 10-12 pieces from sheet music, fold each piece twice (into a quarter/slice) and adhere around the Gluber until filled. 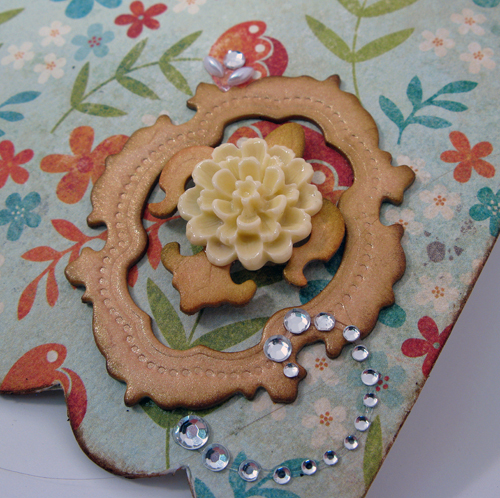 Add the two pins and piece of ribbon to the sticky back of the Gluber, then adhere to the page. Add the bottle cap with a 3D Glue Dot. 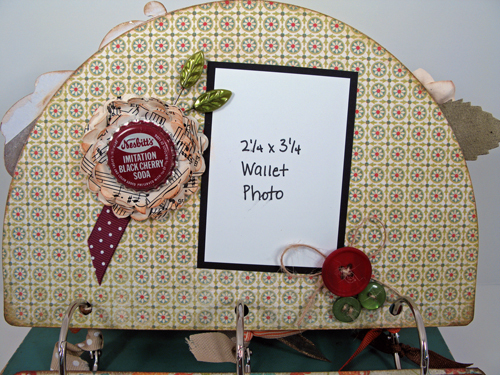 A matted wallet-sized photo fits on this page and I added a little button and twine collage at the bottom. 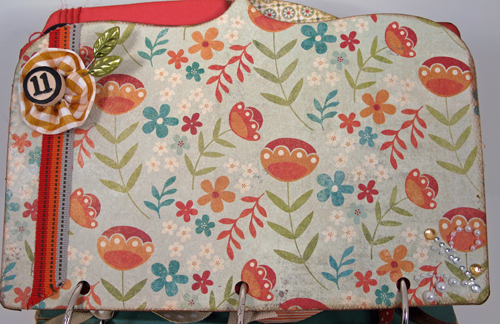 This page reminds me of an apple orchard. 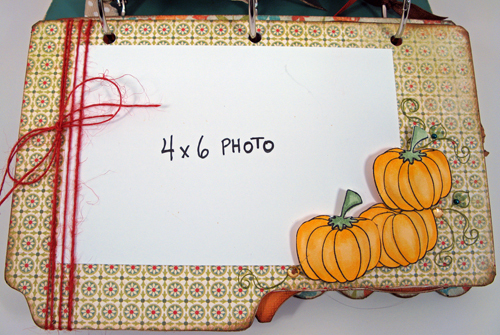 The next page is a simple one with a solid background and coordinating patterned photo mat with a scalloped edge, the bittersweet jute twine from page 2, a big button and a manila tag I stamped with Avocado Art's October set called Ho Ho and Holiday Blessings. I added a bit of velvet ribbon, a couple tiny staples and then put some Glossy Accents on the leaves to give them a dimensional shine. They're colored with Copics and the tag is edged with Distress Ink. 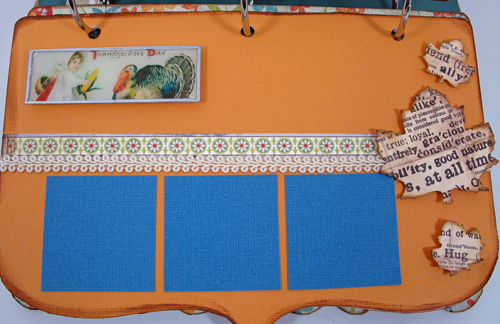 These pages are an ode to Thanksgiving Day, so a photo of the family around the table will go great on this page. Page four continues the Thanksgiving Day theme and on this page I used some maple leaf shaped Spellbinder dies, some decorative cording and a faux soldering technique using an old microscope slide, Glossy Accents, Krylon silver leafing pen and a vintage postcard. To create this piece I simply applied (with my finger) some Glossy Accents to the slide, placed the slide over the image and pressed down firmly to remove any air bubbles and to make sure I got a complete "seal" on the image. 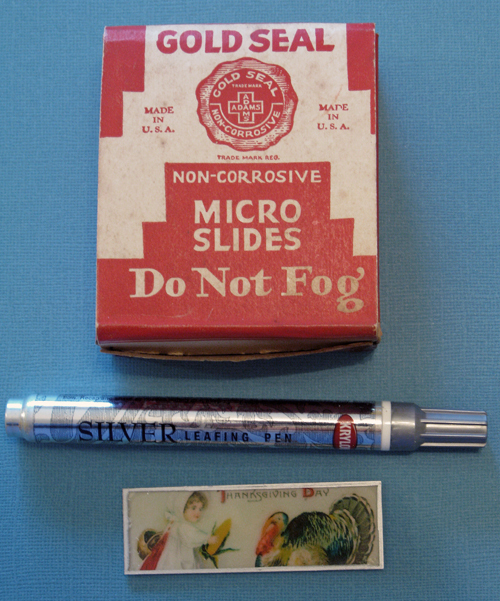 When it was dry I used my Exacto knife to trim around the slide and then ran the silver leafing pen along the edges -- viola! 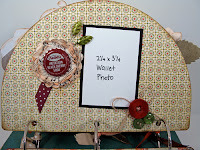 There are three mats available for some little photos, too. 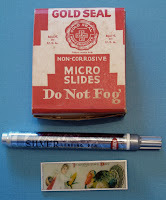 Everything has the aged look by edging with ink. The last two pages are a bit more elegant, but still host that shabby chic look. I used more ribbon, swirled bling with rhinestones and pearls, more Glimmer Chips with bronze Glimmer Mist, a resin flower and a yo-yo ribbon flower with a bingo piece and more vintage leaf pins. 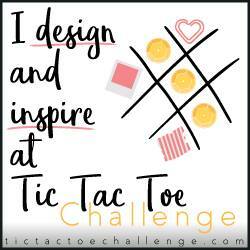 The number 11 is special to me this year, but any fun game piece would look great. Because the album grew in dimension, I needed to bump up the metal rings to 1.5" rings, and added pieces of ribbon to them to make them a bit more pretty. All of the embellishments were from my stash -- you'd be surprised at all the goodies you have squirreled away! 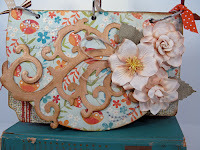 Embellish with relish! 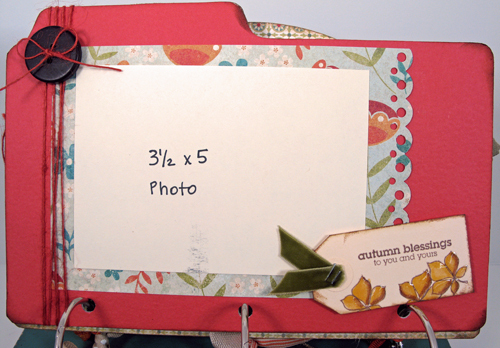 This Autumn Bliss Mini Album is now ready for the season.